This gift was Ryan’s favorite. The reasons why should have been obvious to us. We celebrated Ryan’s birthday this weekend with a wonderful gathering of family and friends. 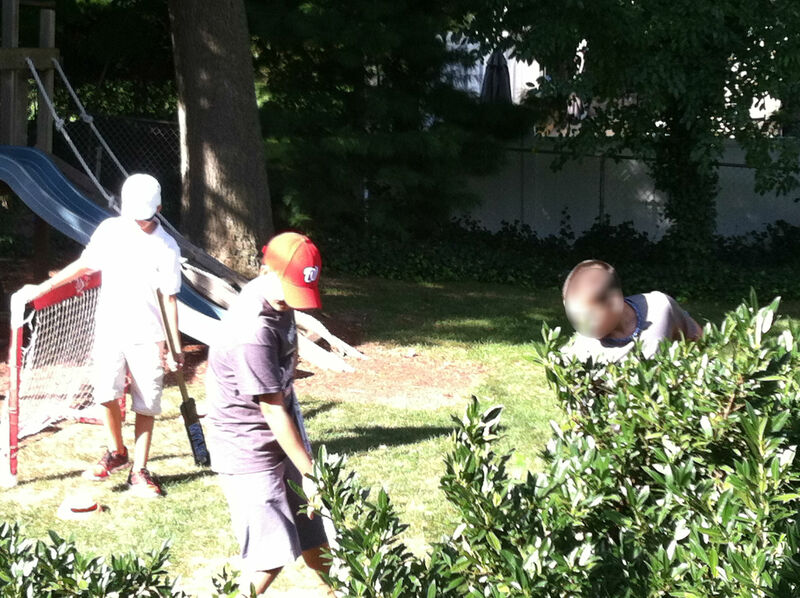 He was socially engaged, guiding all the kids — and even some of the adults — in games of backyard hockey. He got lots of sports gifts. 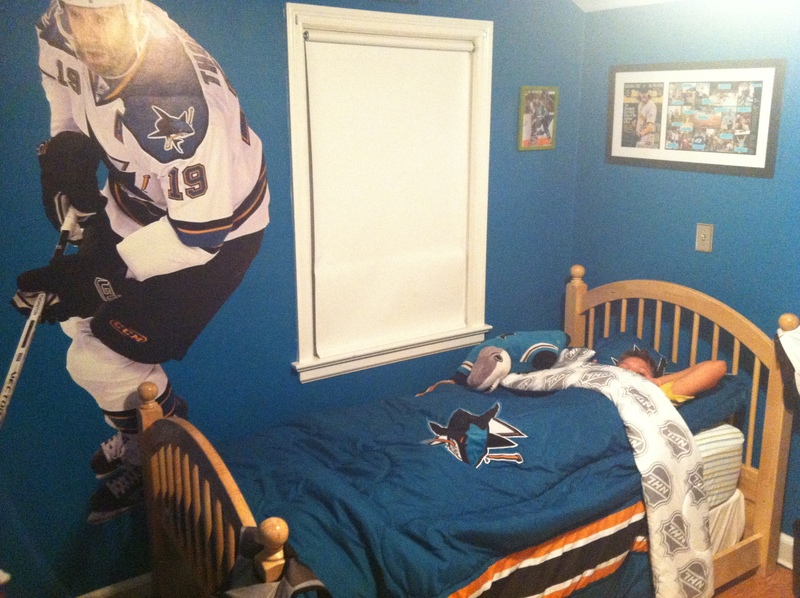 His San Jose Sharks-themed room got even more Sharks-ier with a new team comforter. After some initial hesitation, Ryan was enthusiastic about every aspect of the party, but none more than opening presents. For Ryan’s room to get any more Sharks-themed, I’m going to have to put in ice. Now, my son is not the easiest person to shop for. His interests are narrow, and even if you stay within them, it doesn’t guarantee success. He already owns enough NHL t-shirts to outfit a small island nation. He rolls his eyes at books or non-hockey clothes most of the time. We tried our best with some gear of his new favorite baseball team, the Washington Nationals, that he seemed to like. My brother’s family hit a home run scored a hat trick by finding an NHL goal horn pizza cutter, successfully combining two of his favorite things. We did not expect the present that most captured his attention. In retrospect we should have seen it coming from miles away. 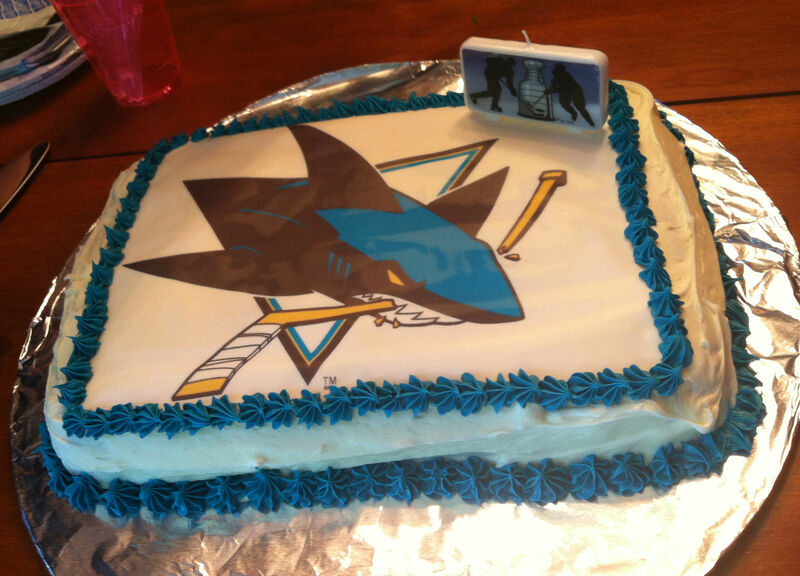 It was a panoramic photo of the Sharks playing in their home arena — the same one that is found at the top of this post. I discovered it on sale and thought it might make a nice addition to his room. I did not expect him to study it with the intense focus we have come to know so well. Ryan was trying to figure out the exact game the picture was from. Of course he was! He connects to the NHL by studying game results and stats. He has committed most, if not all, of the last three seasons’ results to memory. Games, dates, locations, final scores, records before and after. It’s an astounding amount of data. The picture was a smorgasbord of clues. Taken mid-game, it clearly displays the scoreboard, with time, score and shots on goal, as well as the opponent and some stats. There were some players’ names visible. I showed Ryan there was a copyright date, so we knew the picture had to come from before then. I was prepared for him to stare at it for a moment and then tell me the date and final score like some sort of human computer. I am awe of his mind at those moments, but it’s bittersweet, serving as confirmation of both an extraordinary mind and how different it is from most. I’d be lying if I said I didn’t still struggle with that. But Ryan continued to stare, puzzled. He did not know what game it was. More information was needed. We talked about how he could use the various clues in the picture to figure it out. He set the photo aside to open his last presents but came back to it to study some more. I have no doubt that in a few days he will burst into our room to reveal a mystery solved. Sometimes I feel like the key to understanding my son is a bit like solving the mystery in the picture. It’s an exercise in piecing together the clues. It never occurred to us he would take such an instant interest in the photo, but how could we miss it? All the clues we needed were right in front of us. The pizza cutter is too cool. Glad the party was a sucess. Hated missing it. He sounds like such an amazing kid!